I apologise in advance for the terrible pun, read on and youll understand! 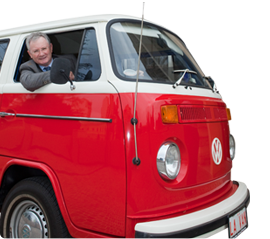 Pictures L - R: Monsignor Keating, Greg Gaunt and Archbishop Hickey with the LAVAN VW Van. Lavan Legal has provided professional services and support to the Archdiocese of Perth for many years. As a valued service partner, Lavan Legal wanted to actively demonstrate its support for such an historic project as The Conservation & Completion of St Marys Cathedral. our city has become a series of dormitory suburbs spread over about 80 kilometres connected by freeways. I fear we are in danger of becoming a city without a heart, both physically and metaphorically. And if our city loses its heart, what hope is there for its soul? We need great projects like this to bring people together in the heart of our city. We must encourage people to come together as a community, to stimulate the respect and mutual obligation which goes with a sense of community. We should never under-estimate the importance of symbolism in influencing public attitudes. If one thinks of iconic places of worship such as St Paul's in London, St Peter's in Rome, Notre Dame in Paris, St Stephen's in Vienna to mention just a few, we all immediately bring to mind a mental picture of those buildings which are not only symbols of their cities, but also symbols of their city's commitment to spirituality, ethical principles including justice, and Christian fellowship in particular. Lavan Legal doesnt view this gift as a donation or a tax deduction - its an investment; an investment in the past and the future, one that will benefit all West Australians. We encourage other prominent Perth businesses to get behind this important project and donate generously to this Cathedral Appeal said Mr Gaunt.